This set contains the complete works by Telemann in which the Viola da Gamba (or viol) has a prominent and soloistic role. The Viola da Gamba may be described as the predecessor of the modern Violoncello, and in its time it was a popular instrument much in use in instrumental music and as part of the Basso Continuo. Its slightly more modest volume compared with the cello is more than compensated by its specific timbre, with its vocal and sometimes melancholic qualities. 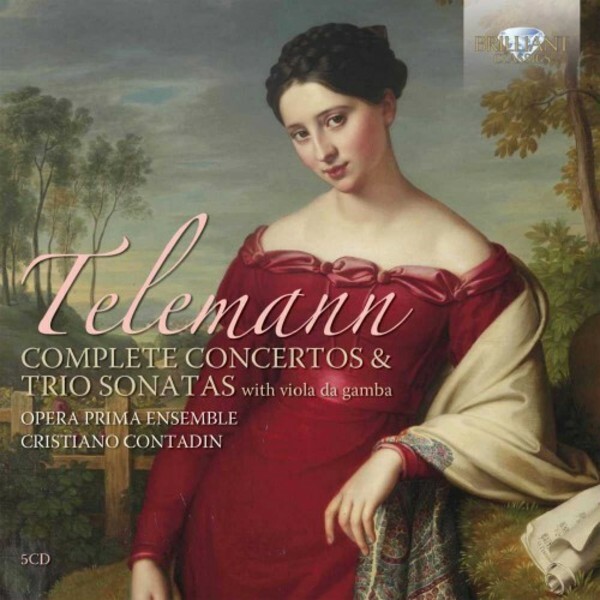 Georg Philipp Telemann, one of the most prolific composers of all time, wrote a fair number of works in which the Viola da Gamba features as a soloist: this 5CD set presents all these works, Trio Sonatas and Concertos, sometimes as the only soloist, sometimes in formation with other solo instruments. As always, Telemann�s music astounds by its originality, freshness and instrumental brilliance. These are excellent performances by leading Italian instrumentalists, well versed in the art of Authentic Performance Practice.